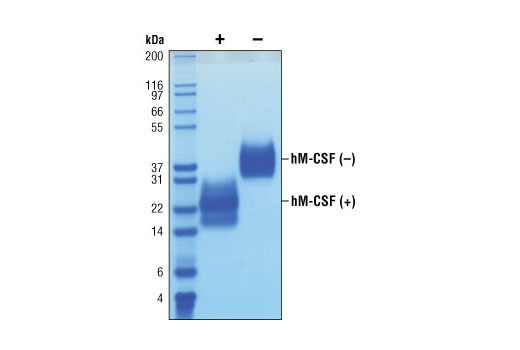 The purity of recombinant hM-CSF was determined by SDS-PAGE of 6 µg reduced (+) and non-reduced (-) recombinant hM-CSF and staining overnight with Coomassie Blue. The proliferation of M-NFS-60 cells treated with increasing concentrations of hM-CSF was assessed. After 48 hour treatment with hM-CSF, cells were incubated with a tetrazolium salt and the OD450 - OD650 was determined. 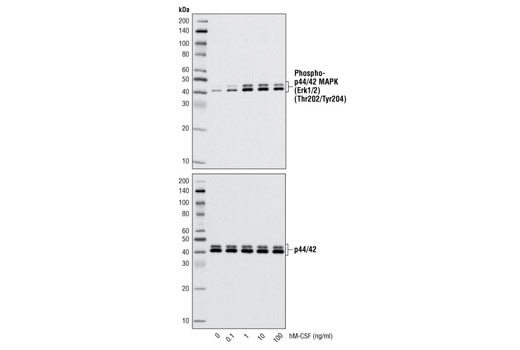 Western blot analysis of extracts from M-NFS-60 cells, untreated or treated with hM-CSF for 10 minutes, using Phospho-p44/42 MAPK (Erk1/2) (Thr202/Tyr204) (D13.14.4E) XP® Rabbit mAb #4370 (upper) and p44/42 MAPK (Erk1/2) (137F5) Rabbit mAb #4695 (lower). Recombinant human M-CSF (hM-CSF) Glu33-Ser190 (Accession #P09603-3) was expressed in human 293 cells at Cell Signaling Technology. >98% as determined by SDS-PAGE of 6 μg reduced (+) and non-reduced (-) recombinant hM-CSF. All lots are greater than 98% pure. Recombinant hM-CSF contains no "tags" and the nonglycosylated protein has a calculated MW of 18,403. DTT-reduced protein migrates as a 16-26 kDa polypeptide and the non-reduced cystine-linked homodimer migrates as a 34-40 kDa protein. Heterogeneity in SDS PAGE is due to glycosylation. The expected amino-terminal EEVSE of recombinant hM-CSF was verified by amino acid sequencing. 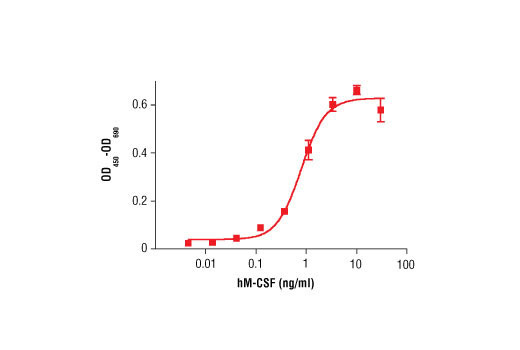 The bioactivity of recombinant hM-CSF was determined in a M-NFS-60 cell proliferation assay. The ED50 of each lot is between 0.5-15.0 ng/ml. Less than 0.01 ng endotoxin/1 μg hM-CSF. With carrier: Lyophilized from a 0.22 μm filtered solution of PBS, pH 7.2 containing 20 μg BSA per 1 μg hM-CSF. Carrier free: Lyophilized from a 0.22 μm filtered solution of PBS, pH 7.2. Macrophage-colony stimulating factor (M-CSF) is produced by fibroblasts, endothelial cells, stromal cells, macrophages, osteoblasts and other cell types (1). M-CSF is required for growth and differentiation of monocytes and macrophages (1,2). M-CSF polarizes macrophages into the M2 phenotype where anti-inflammatory IL-10 is produced, rather than the M1 phenotype where inflammatory cytokines are produced. M-CSF also recruits monocytes and enhances angiogenesis by inducing VEGF production (1,2). M-CSF binds to its receptor (CSF1R); downstream signaling involves PI3K/Akt, ERK and STATs 1, 3, and 5 (1,3). An increase in M-CSF expression may contribute to cancer progression and a higher plasma M-CSF level is associated with rheumatoid arthritis (1,4,5). Hamilton, J.A. (2008) Nat Rev Immunol 8, 533-44. Curry, J.M. et al. (2008) PLoS One 3, e3405. Rioja, I. et al. (2008) Arthritis Rheum 58, 2257-67. Skrzypski, M. et al. (2008) Clin Cancer Res 14, 4794-9. Hamilton, J.A. (1997) J Leukoc Biol 62, 145-55. Azzam, G. et al. (2013) PLoS One 8, e74297.